Flipping through my timeworn recipe box is like a fun walk down memory lane. The site of my grandmother’s distinctive penmanship, hand-written notes from old friends, and recipes that I made for special occasions all take me back to a different time and place. As the archives on my blog continue to grow—at last check there were 717 published recipes!—I take similar pleasure in reading through and cooking the old ones. Usually there’s a bad photo to laugh at, too! In my original post I mentioned that I could eat meal this for dessert. 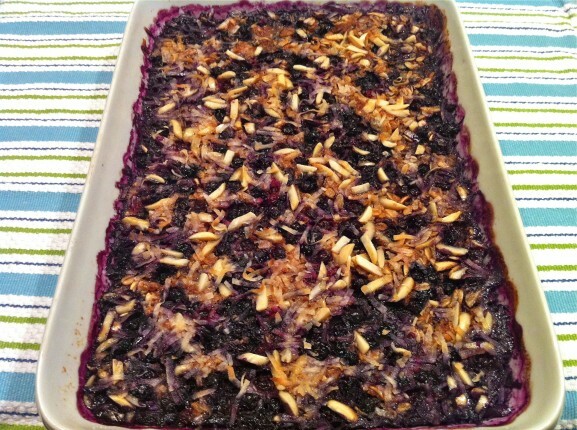 It’s a bit like a blueberry cobbler, although the early version was sweeter thanks to the use of sweetened coconut and a quarter cup of brown sugar sprinkled on top. Feel free to continue using that method if you prefer the added sweetness. On the other hand, if you want to dial the added sugar back even further, rest assured that a drizzle of maple syrup of sprinkle of brown sugar upon serving will make up for too drastic a reduction. At one point I completely omitted the brown sugar on top, and I thought it was not quite sweet enough. My recommendation when reducing the sugar is to reduce more heavily from the base recipe and leave the sprinkle on top where you’ll taste it first. My kids are on board with the following level of sweetness, in case that adds any helpful insight! While the original recipe was written using a 9×13 baking dish, I’ve made this in just about every pan size over the years, down to a 9-inch square (pictured directly below–this is also a slivered almond, no-sugar-on-top version). Personal preference as to thickness ultimately dictates here. Lately I’ve been settling on an 8×11 pan. I’ve included a variety of options and corresponding baking times in the updated recipe. 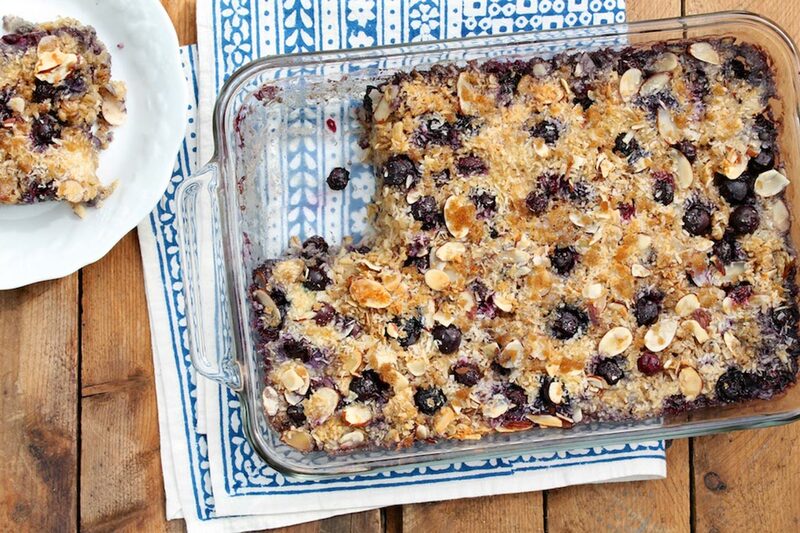 This wholesome breakfast is bursting with antioxidant-rich blueberries and crunchy, protein-packed almonds and is further enhanced by the tropical flavor of coconut. It has a novel preparation and is quick and easy, too. If you don’t care for coconut, simply omit it from the recipe. For added ease, prepare this filling casserole the night before and gently reheat in the morning. Serve as is or with a dollop of Greek yogurt or a drizzle of milk. In a large bowl, mix together the oats, 1/4 cup of the coconut, 1/4 cup of the almonds, baking powder, cinnamon, and salt. If using the optional banana, lay the slices over the bottom of the prepared baking dish. Then sprinkle half of the berries over the bottom of the baking dish. Cover the fruit evenly with the dry oat mixture. Slowly drizzle the milk mixture over the oats. 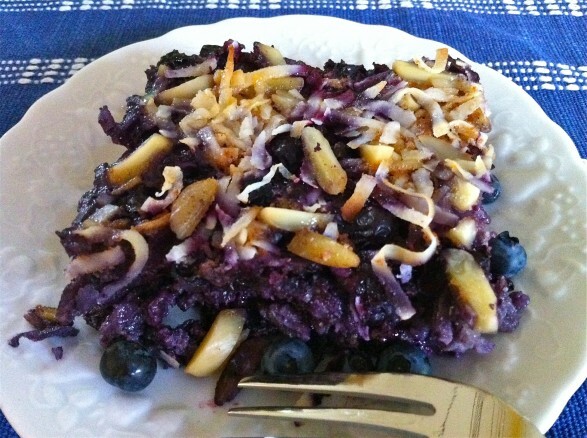 Scatter the remaining blueberries, coconut, and almonds over the top. Finally, sprinkle the brown sugar over all. Bake for 25 to 35 minutes or until the oat mixture has just set in the center. Remove from the oven and let cool for a few minutes. *When using melted coconut oil or butter, it is helpful if the cold ingredients have come to room temperature prior to mixing so that the oil or butter doesn’t re-harden once stirred in. If this happens, you may slowly heat in the microwave until the liquid mixture is just warm enough to soften the butter or coconut oil. **I have made this oatmeal in pan sizes ranging from 9×13 to 9×9 and they all work well. In my oven, baking time for a 9×9 pan is 35 minutes, a 9×13 pan is 25 minutes, and an 8×11 pan is right about 30 minutes. Choose your pan size based on what you have and how thick you think you might like your pieces–and then check a few minutes early until you know how long the oatmeal takes in your oven. I have baked oatmeal on my list of things to try. Love the combo of ingredients here. Coconut and almonds. Yummy! Sounds delish! 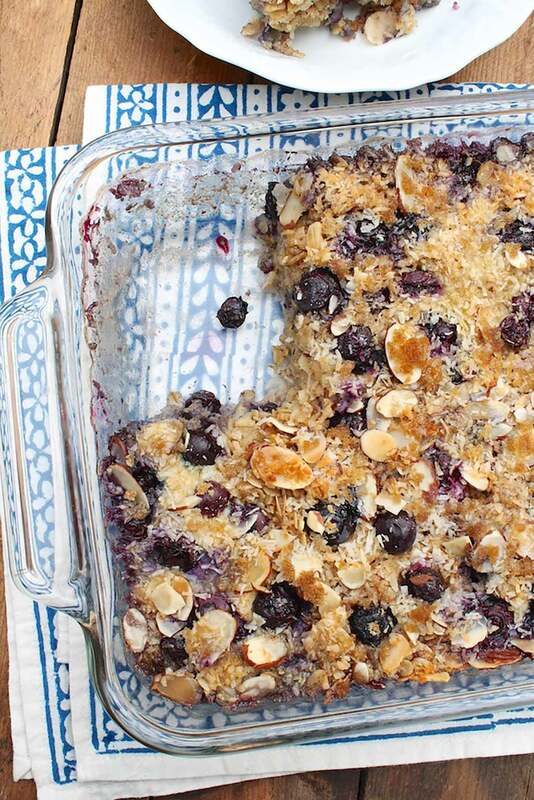 I love baked oatmeal, I will have to try this on the weekend. I just bought some fresh wild blueberries that will be perfect for it too. Fresh, wild blueberries are delicious! That is what I used in this batch. If you make it, let me know what you think…It has been a hit in our house! Thanks for letting me know, Sara! Please let me know what you think! I would give a range of 6-8, depending on appetite. Looking at the amount of the various ingredients, you could actually eat a quarter of the pan and not be off the charts in terms of calories or fat…but that would be a very large piece! I have never had oatmeal baked. This looks and sounds absolutely delicious and I will be trying it this weekend! Thank you so much for the recipe. You are very welcome and I really hope you like it. I have experimented with many different versions of baked oatmeal so there is more to come if you approve! I am so excited about finding your site and this recipe! I had lots of fresh blueberries on hand and wanted to find a nutritious recipe to make for my daughter who has cystic fibrosis. So I googled “blueberries oats coconut oil” and found your recipe that also uses several other ingredients (e.g., sea salt, cinnamon) that are great for her health! I made it right away and it is in the oven now. 🙂 I am going to put a link to your page on my Squidoo lens where I wrote about the natural things we are using/doing to help treat my daughter’s CF. Thanks so much! You are very welcome, Melanie, and I hope it was a hit with you and your daughter. If you do like this baked oatmeal, I have some other versions which are all easily adaptable to include various nuts, use different oils–I have made them every which way! My recipe for gluten-free strawberry shortcakes also makes a great breakfast cookie, and perhaps that is something she would enjoy. Thanks for taking the time to comment! Just found your site and love looking at all the recipes. We can’t have oats. Is there anything you recommend substituting? Maybe quinoa? Also for the milk would almond or coconut milk work? Thanks! I’ll try the quinoa. Silly question but do I cook the quinoa first before mixing it with all the ingredients or put it in dry? Not a silly question and there is no need to cook first. I am curious as to how this turns out using all quinoa since I have yet to try that with this recipe. I look forward to your review! I just reread this comment after receiving another on this recipe and thought you might enjoy the following baked quinoa breakfast recipe that I posted since my first comment. this blog and I am impressed! Thank you!! 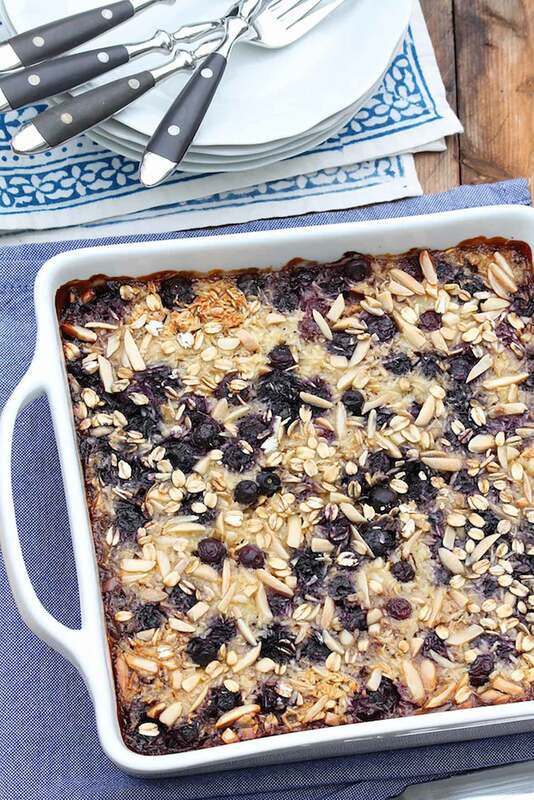 That baked oatmeal IS good enough to eat for dessert. I used unsweetened coconut and it was sweet enough. I used a can of coconut milk and added enough extra milk to make two cups. It’s delicious hot or cold! I love your recipes because they are healthy and delicious. It is so disappointing to try a new recipe that is good for your family but no one will eat it! Your comment made my day, Trudy. I am thrilled you were so happy with this recipe and hope you find many more you enjoy as well! I’ve made this often and thought I should finally comment to say how much my whole family enjoys it! Thank you! I’m so glad this is a recipe that your whole family enjoys, Niki! You have great recipes . Hi Deborah, Thanks for your message. I have talked to a number of people who are diabetic, and the requirements have varied from person to person. Some focus on added sugars, others strictly on total carbs, and some look to portion control to achieve their goals. If you could provide a little more information on what you are hoping to achieve, I might be able to help! This was easy to make and is delicious. Do you have any nutrition and calorie information for this recipe? This is delicious.. I decided to freeze individual pieces to eat later. I microwaved it for 1 minute and it was perfect. Thank you for your freezer tip, Mary Beth－love the convenience!－and so glad you enjoyed. I made this early in the week and have been enjoying the leftovers every morning since. Delicious warm or cold! Thank you for the great feedback, Gina!